Going to college is an essential component of building financial stability, particularly if you come from a low-income family. At least that’s what we often assume. But assumptions often need qualification. It is true that there is a million dollar difference in earnings between those who hold degrees and those who have no training or education beyond high school. It is also true that the type of degree you earn is a big factor in whether you’ll find a job and stay employed. Researchers at Georgetown University, for example, have analyzed unemployment by major and found that those who earn job-related degrees generally have lower levels of unemployment than generalists. They also often have higher starting and mid-career salaries. In many cases those earning one-year certificates or associates degrees in specific occupations like heating and air conditioning repair or nursing earn higher salaries than bachelors degree holders in generic areas like liberal arts or humanities. None of this may come as any surprise. But it should serve as a reminder that the prosperity bought by a four-year degree is not the same for everyone. A new study by my Demos colleague Robert Hiltonsmith adds fuel to that fire by illustrating the long-term effect of college debt. Hiltonsmith modeled the lifetime earnings and asset accumulation of two types of families. On paper, both types of households in the example are solidly middle class. Both include two adults who have earned four-year degrees in the same fields at public universities. The earners in each household find similar jobs out of college, earn similar salaries throughout their careers, have the same number of children and buy houses at roughly the same time. Despite all the similarities and being equal in all other ways, one household ends up with about $200,000 more in assets (home equity and retirement) by the time they are 64. Can the difference between these two families be attributed to a wise investment strategy? Not really. Is it luck? Not exactly. The difference is whether or not they have student loans. Hiltonsmith calculates that the average lifetime assets accumulated by a two-earner household in which each earner has left school with $0 in student loan debt is about $1.2 million. In comparison, Hiltonsmith finds that a two-earner household who leaves school with average student loan debt (about $53,000) ends up with $1 million in assets. Many of us would see that and think $1 million is pretty awesome actually. But $1.2 million is of course even better. The point of making this model, though, is that it is a best-case scenario. About two out of three students (66 percent) graduate with student loan debt, and the amount they are borrowing is growing each year. As college costs continue to rise, loans are an unavoidable imperative - particularly for low-income, first generation students. But as the evidence grows about what kinds of degrees are more secure in terms of salary and employment and about the effects of student debt on asset accumulation, there is much need for caution on the part of borrowers. Students rarely consider themselves consumers of educational services and financial products. But they would be wise to do so. However, the larger picture of the student loan drag on the economy should not be ignored. 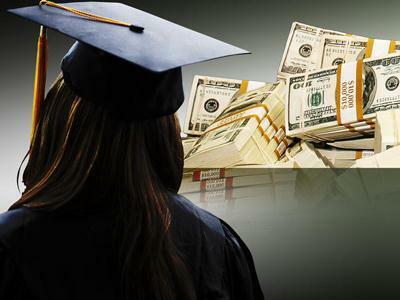 Student loan debt totaled $204 billion in 2003. Today, a mere 10 years later, it is more than $1 trillion. And it is projected to double to nearly $2 trillion in the next 10 years. Using Hiltonsmith’s model, the current $1 trillion in debt will mean about $4 million less in assets for those students who take out loans. Is that really a tradeoff we want the economy to make? Jennifer Wheary is a senior fellow at Demos where she writes about current trends in education, economic opportunity and positive public policy. She holds an undergraduate degree from Cornell University and a PhD from the University of Illinois. Her writing appears online and in newspapers around the country. You can follow her on Twitter @edteachpolicy.